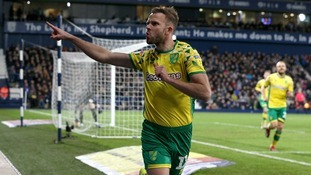 Jordan Rhodes struck late to earn Norwich City what could turn out to be a priceless draw away at promotion rivals West Brom. The Canaries were trailing for most of the game courtesy of an early goal from Dwight Gayle, but Rhodes converted a cross from fellow substitute Kenny McLean in the 83rd minute to rescue a point. It had looked like it wasn't going to be Norwich's day after the Baggies dominated the first-half at a sold out Hawthorns, but Daniel Farke's side improved after the break and eventually got their reward. However, Sheffield United's 1-0 win over QPR means the Blades replace Norwich in the Championship top two on goal difference - although Norwich could move back into the automatic promotion spots if they manage to beat Birmingham City in their next game at Carrow Road on Friday night. Meanwhile, a goal from new signing Will Keane ensured that Ipswich Town picked up a priceless victory over relegation rivals Rotherham United at Portman Road. The 26-year-old, who recently joined on loan from Championship rivals Hull City, scored the only goal of the game just after the half hour mark. Town still remain bottom of the league, but the victory means the gap to safety has now been cut to seven points.